What you need to know about SB 276, your rights are at stake! Most of you know that I have taught vaccine safety/education classes for. For those of you who have yet to engage me in the conversation, know that you can at any moment, in a completely non-judgemental and unemotional way. I love teaching about this very divisive topic. If it wasn’t for the media, we would not be so divisive. Trust that this is NOT an anti-vaccine email. I write this email with as much humility and love for humanity as I can. For those of you who have been to one of my classes or have talked to me about it, you know I view this subject with a lot of logic, science, forethought and consciousness. I’ve studied this topic and I have been driven to do so because of my own personal experience with my patients to which I was never given answers by our medical systems. Seeing patients lives changed before my eyes and more importantly lives of children. Having had family in the medical field, and having a bad experience with my own personal health in the medical system I knew that I needed to research real facts. For those of you who do not know about the recent history of vaccination legislation in California please read on. This is a very abbreviated list. In 2012, AB2109 was passed which required parents to obtain their doctor’s signature on a government form prior to enrollment in public school if they wish to skip one or more vaccines for their child. The bill required all parents exercising their right to choose their own vaccination schedule for their children to sit down with a medical provider and have a government document signed showing they know the risks of the decision. Prior to this, parents could freely submit their own documents – legislators primarily wanted parents educated about the risks of disease. In 2015, with SB277 the California State Legislature took away personal belief and religious exemptions for vaccinations. This left parents who were looking to educate themselves on other options regarding the vaccine schedule and do something different than what the CDC mandates to find a pediatrician who would be open-minded about the parents’ right to choose. A big change with SB277 was the medical exemption became necessary for both public and private school systems. The pediatrician now had full control over this medical intervention and legislators promised the doctor-patient relationship was of the utmost importance. This year, with SB276, it is different. They are removing your pediatrician’s ability to make a clinical determination regarding your child’s ability to be vaccinated or qualify for a medical exemption if necessary. We can clearly see how slowly yet pervasively our rights surrounding vaccines are being stripped. You doctor will no longer by law be able to do anything outside of the CDC mandated schedule. Even some severe reactions following vaccines may not qualify for an exemption. Family history, genetic testing, etc will no longer qualify for exemption. Your only option is homeschooling if you want anything other than the CDC mandates schedule for vaccines for your children. The power now lies solely with the state. A public health official who has never met your child now has full control as to whether they should or should not be vaccinated. There are only 0.7% of children with medical exemptions in California. Even with the small increase in medical exemptions (because personal belief exemptions got taken out), there has been a net DECREASE of over 10,5000 exemptions since 2015. The CA medical board has already dismissed the majority of investigated complaints with NO VIOLATIONS FOUND. Additionally , health officers discovered few or no problematic medical exemptions according to a recent study. If a handful of invalid exemptions exist, the CA Medical Board should address them individually without punishing all the medically fragile children in California with legitimate exemptions written by doctors who followed the law. Vaccine injured children, genetically susceptible children, and their at risk siblings need to be protected with medical exemptions, and licensed physicians are the only ones qualified to write them. There are NO long term inert placebo controlled trials to prove safety for ANY vaccines. NONE. Since 1986, a law was passed making vaccine companies (pharmaceutical companies), doctors, hospitals, pharmacies, etc. untouchable– they can not be held liable for any vaccine injuries. Nearly $5 billion have been paid out from your tax dollars for damages, injuries and death from vaccines. In 1986, there were 11 required doses of childhood vaccines and as of next year (2020), there will be 75 required doses of childhood vaccines. By the age of 18. This schedule has never been tested for safety and it has been clearly shown the multiple doses on one day leads to injury. In 2016, 59,117 injuries were reported to VAERS (CDC’s Vaccine Adverse Event Reporting System) including 432 deaths, 1091 permanent disabilities, 4132 hospitalizations, 10,284 emergency room visits. AND the Department of Health and Human Services has determined that fewer than 1% of adverse events are ever reported. (~5.9 million injuries in 2016). This is about campaign contributions, not health. Pharmaceutical companies have donated millions to lawmakers who push mandatory vaccination and attack exemptions. In the end, please do your own research. I don’t claim to know everything, but what I know for sure is the importance of following your intuition to make a mindful decision. Most of our patients are fully vaccinated. Many do a delayed schedule via Dr Sears or Dr Paul Thomas’s protocols. Both of whom are pro-vaccine, pro-science and pro-informed consent and I frequently recommend their work. I hope you know by now that I am not anti-vaccine. Like a growing number of pediatricians, MDs, scientists and lawmakers, I am pro-informed consent, pro-safety and pro-science. I will have you consider that in a liability-free market (like vaccines are), industry is allowed to run rampant and they have run their course. Consider the reason you exclusively hear vaccines are only and always “safe and effective” is because the largest lobby in DC is the pharmaceutical companies (by 4 times) and the largest sponsors for all major media sources are pharmaceutical companies. Attend the rally to oppose SB276 on April 24th at the state capitol. Consider donating to A Voice for Choice. This is our state’s advocacy group and they are looking to hire one more lobbyist for Sacramento. Know that on any given day, the pharmaceutical companies have more lobbyists on capitol hill that we do legislators. Call your local representative to voice your opinion and protect your doctor-patient relationship and your rights to make conscious choices surrounding childhood vaccines. Below is a script you can use when you call! They need to hear from you! Thank you for reading this email. Please take action. If this email offends you, I apologize. The purpose of this email is to inform, not to offend. Our freedoms are at stake and this affects the lives of all of us and our children. “Hi, my name is ____ and I am a constituent. I am calling to ask Senator ____ to OPPOSE S.B. 276, which would severely restrict medical exemptions to vaccination. Medical exemptions are already very difficult to obtain. This bill is trying to make the process even more arduous. The doctor-patient relationship must be protected. Only a doctor should be able to determine whether or not a child is medically contracted to vaccination. An appointed official who has never examined my child should not be making medical decisions that carry the risk of serious injury and death. Adverse reactions are clearly listed on all vaccine manufacturer package inserts. This bill also requires that medical exemptions be tracked in a government database, which creates potential HIPAA and FERPA privacy issues. If you need anymore information or research I will have printable documents at each office. The only way to get this to not pass is we HAVE to show up. Posting on facebook will no longer work. We have to be active and show up to our legislators. If this gets passed, it will be the end to any human rights, and homeschooled children won’t be safe either. Happy Monday Everyone! 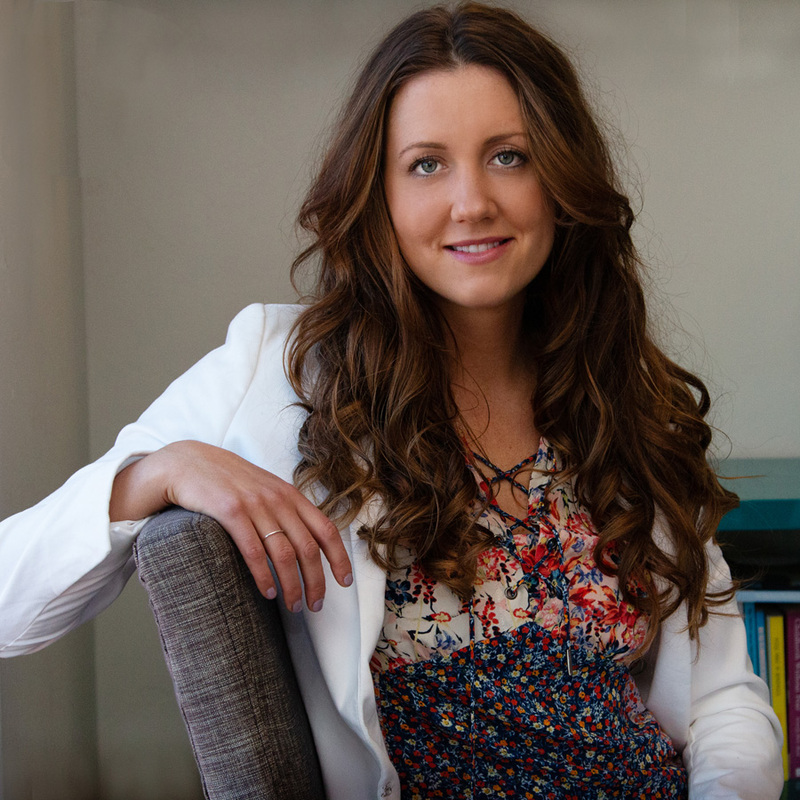 I hope you enjoyed last week’s topic about surviving allergy season! This week we will be talking about Triggers for Disease and Injury- The all important topic of INFLAMMATION. INFLAMMATION ISN’T A DISEASE, IT’S A REACTION. IT ALWAYS HAS A TRIGGER OR A FEEDER MECHANISM OR BOTH!! In 2014, American’s spent 4.4 billion on OTC pain relievers (Including anti-inflammatories) on several primary medications: aspirin, acetaminophen and ibuprofen. Currently, 46,000,000 adults in the US have physician diagnosed arthritis, in one form or another and that is projected to reach 76,000,000 by 2030. It’s time to RETHINK inflammation! If you chase inflammation or just give anti-inflammatories, even the NATURAL form, you are just putting a bandaid on the situation. -When there is an injury to a joint, muscle whatever it is. The inflammation of that area actually stimulates healing and new tissue formation. But what happens when you take an NSAID is the pain is gone, but the inflammation is also down meaning that actual cellular repair never happens. When you interrupt or block inflammation, healing is also blocked. This is why people live off of anti-inflammatories, because the pain WILL come back because the tissue has not been healed. These mechanisms must be addressed in order to bring you back to a state of true health. All too often, even in the natural field I am in, inflammation is treated as a disease, in and of itself and therapy is short-sided and focuses only on inflammation reduction. If we merely just prescribe natural anti-inflammatories instead of pharmaceutical ones, what great things have we done?? We have to address those TRIGGERS! You find the root cause is gut inflammation caused by pathogenic bacteria. -Why is the bacteria there in the first place? -How do you resolve the bacterial presence? -How do you resolve damage to gut epithelial tissue? 4 months later their digestion is better, gut pain is gone, elimination and stool form is back to normal, but still residual pain in the musculoskeletal tissue. WHY? Well, we have only addressed initiation or the cause, now we MUST address resolution. Ways you get ride of waste and toxins are lymph, liver, kidney, skin, lungs GI, tongue and fat. If they don’t work well neither do you. YOU CAN’T REGENERATE, IF YOU CAN’T ELIMINATE..
Let’s talk resolvers (return to original state). Well depending on what the TRIGGER is, after addressing it through initiation, resolution means then giving nutrients that heal the aftermath. These nutrients can come in the form of actual physical modalities to get blood flow, ect back to the area, or actual nutrients. -Your body doesn’t just stay sick for no reason, it wants to heal. What happens to all the cellular waste from the old cells when you make new ones? If they can’t get out they stay inside you. Hence no resolution of inflammation. Nutrients like essential fatty acids are not anti or pro inflammatory per say. Rather, they either up or down regulate the production of pro-inflammatory mediators, balancing inflammatory processes so that healing can occur with undue damage to surround tissues. They contain something called a pro-resolvin, which brings the inflammatory process to an end. Most western diets have an overabundance of omega 6 fatty acids and include insufficient amounts of omega 3s and 9s. High omega 6 and low omega 3,9 intake tip this system out of balance. Our endocannibioid system in our body also runs off of fats. So we must intake good fats for cellular repair. So utilizing high grade omegas are one way of resolution, but there are many others such as hemp oil which turn on cellular repair mechanisms. Hemp Oil complex- includes calamari oil (omegas, pro dissolving mediators), broccoli (cellular repair, NRF2, Heat shock proteins), hemp(endocannibinoid activator). Combining this with their Tumeric Forte (turns off the inflammatory master switch). Resolving inflammation means you must find the initiator and heal the aftermath, but the quality of nutrients and right balance is needed. If you are just also chasing inflammation with your providers, it’s time to take a different look. Look at where it’s actually coming from, fix those methods through alternative modalities and heal the brain, then come in with tissue healing protocols. That’s all for now rockstars. HAPPENING TODAY!!! Please RSVP!!! We NEED to STOP THIS! They are trying to dismantle taking away even medical exemptions. Soon, this will be mandated for adults too. Juice lemons, turmeric and ginger in a juicer. 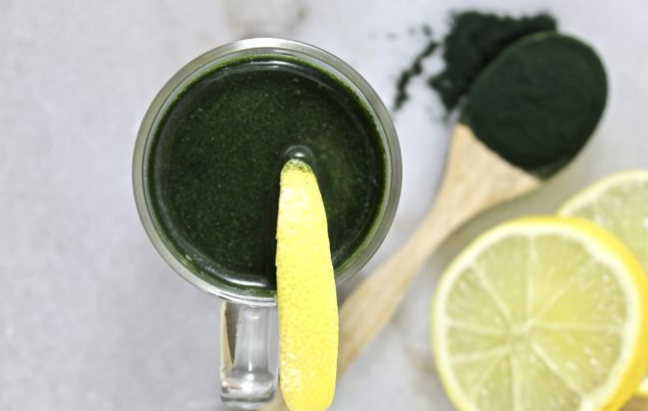 Combine juice and spirulina in a drink or protein shaker, shake well. Pour into serving glasses, drink immediately & enjoy! This shot is sour – if you’re looking to sweeten it, add an apple to the juicer or honey to the shaker! If you don’t have a juicer, add 1/2 cup water, blend and use a mesh cloth to strain. April Allergies… Avoiding an Allergic Meltdown. It finally feels like it’s getting close to summer after this weekend! So much rain! With so much rain means lots of things in bloom, pollen and grass. Well believe it or not, I used to suffer from extreme hayfever and allergies every single year. I couldn’t go outside much, be around grass, or really have any fun! Fast forward about 5 years, and minus the occasional sneeze, I can be outside with absolutely no problems! HOW did I achieve this MAGIC?! Well, it’s no magic, you just need to understand a few things about the airway and sinus system to play the allergy game. 1. The joints within the head. A lot of people will say they have a “sinus headache” or “sinus pain”, when in reality the joints of the head aren’t moving properly and are inflamed. what does that mean? That means that their will be a lack of oxygen to the brain, no proper drainage in the sinuses, and a PERFECT environment for pathogens to live in. *Pathogens LOVE no oxygen. They thrive in it. So when things aren’t moving, and oxygen is less, they thrive. Craniopathy care will help correct this. 2. Narrow Sinuses. This goes along with the cranial system, but if you have narrow sinuses, your oxygen level won’t be as great. Craniopathy care can help, but in reality you may need further work like myofunctional therapy or nasal surgery. 3. Infections. Mold in particular is realllyyyyy common to have chronically in the sinuses. This creates chronic inflammation, which means when dust and pollen come your way you will most likely react. Craniobiotic Technique, a technique I use in my office can really help to clear out those infections quickly and give relief. 4. LIVER. The liver is a big one for allergies. Food and Airborne. Most of the allergy supplements out there contain some liver support in them, you just don’t know it! Thats because when the liver is congested, it will make you more reactive to allergens. Doing a liver detoxification can really help clear this up. 5. Gut health. Keeping that gut healthy will be a sure way to help with allergies. That’s because the inflammation levels will be down. If you have leaky gut, you will absolutely have more severe allergies. Thats because the food for instance will go straight into the bloodstream where antibodies will be activated. For airborne allergies, there is more overall inflammation and we all know by now about the gut/brain axis, so it will affect that circuit. The Stomach must also be looked at. Improper protein digestion and you’ll have way more food allergies. 6. Actual Allergy Desensitization. You can also desensitize your body from certain allergens. Usually it’s just an improper brain response. Craniobiotic Technique in my office can also be used to desensitize airborne allergens. Studies in mice have shown that antihistamines promote the growth of malignant tumors. Scientists at the University of Manitoba believe that the consumption of various medications, including antihistamines and antidepressants, may increase the risk for cancer. In February, 1994, the Department of Health and Human Services noted an increase in the incidence of cancer in the United States. Scientists at the University of Manitoba believe that the consumption of various medications, including antihistamines and antidepressants, may increase the risk for cancer and may be part of the reason for the increase. They have demonstrated that drugs like Elavil, Claritin, Hismanal, Atarax, Unisom, Prozac, NyQuil and Reactine have all created tumors in animal studies. Some antihistamines behave like the drug DPPE, which has been linked to enhancing tumor growth by binding to histamine receptors, which interferes with enzymes designed to detoxify and remove poisons from the body. This will also interfere with the system that regulates cell growth. The drugs do not necessarily cause cancer, but can enhance the growth of cancer. Antihistamines block your P-450 cytochrome which is involved with the bodies phase 1 and phase 2 detoxification process. If you block your livers detoxification process you shut down the immune system.There are other drugs that also block this pathway: antibiotics, steroids, NSAID’s, pain medications, antacids, and some antidepressants. If you have a “sick” liver meaning it’s plugged or infected, you will have allergic reactions very easily. Here are some natural solution to help get you relief quickly. 1. Use X-Clear Nasal Spray. This natural spray consists of xylitol, grapefruit extract and saline which helps fight infections in the nasal passageway, and open the airways a little. 2. Arginex or Allerplex by standard process. These are supplements I love to use for allergies. They both have support for the LIVER. That’s why they work so well! 3. D-Hist by OrthoMolecular. This is a natural form of an antihistamine. It helps decrease that histamine reaction that happens when exposed to allergens. 4. DoTerra Triease .Each softgel contains equal parts of Lemon, Lavender, and Peppermint essential oils, known for their ability to maintain clear breathing and a healthy immune response when combined together. Used by both veteran and novice essential oil users, this well-known blend is frequently mixed together for its respiratory health benefits. (You can purchase on my website, or PM me to get wholesale cost). Think twice before running to those antihistamine drugs! ALSO GUYS!!! PLease Please join us on the 15th, to fight to dismantle the SB 276!! California, the time is now! Senator Pan has introduced the bill we have all been expecting. SB276, a bill to restrict vaccine medical exemptions in California, has gone live and Assemblything Lorena G is the first coauthor. 1. All medical exemptions must be approved by the State Public Health Officer (or approved designee). 2. All medical exemptions must be based on CDC contraindications only. These are VERY narrow – basically anaphylaxis. 3. All medical exemption requests must be submitted on a standardized form created by the California Dept of Public Health (CDPH). 4. All medical exemption requests will be tracked in a database managed by the CDPH. This will include personal and sensitive medical information about your children. 5. Any medical exemption written PRIOR to SB276 will also need to be approved by the CDPH and included in their database, by July 1, 2020. If the grandfathered medical exemption is deemed “fraudulent,” it will be invalidated. 1. Call the Senate Rules Committee (916) 651-4120 and politely ask that SB276 is double referred to the Senate Health Committee and the Senate Business, Professions and Economic Development Committee. 2. Call the following Senators (we will be calling several a day so that we can hit them all fairly quickly). Urge them to NOT coauthor SB276 and to vote NO when/if if comes before them for a vote. 3. You have two legislators – a Senator and an Assemblyperson. Call them both. Ask for a meeting with the legislator (not a staffer) in the next few weeks in their district office to discuss SB276. Ask if they have any townhalls or coffee talks on the calendar in the near future. Let us know what you find out! 4. Start talking to people: friends, family, doctors, nurses. Let them know what Pan is up to with this bill. Invite them to join Parents United 4 Kids. Happy Monday Everyone! I hope you all had a beautiful weekend and are enjoying this month’s topics revolving around the brain and brain injury! Last week we talked about PTSD, emotional dysfunction and brain injury, so if you missed it, it’s a good one! Head on over to my website to catch up! Brain injury, PTSD and messed up emotions.. Whats the connection? To end out the month of March, I thought we’d finish up with some nutritional recommendations that can be helpful when dealing with brain injury and just overall boosting your brain’s ability to function. This is of course, after having done the first things we talked about this month like Craniopathy care, emotional help, and assessing the jaw/bite. These must be done first, but there are great anti-inflammatory foods as well as nutritional recommendations that can be very helpful to help the brain and nervous system heal more effectively. 1. Your brain utilizes 25% of the food energy we consume. That means whatever we put into our body, 25% of that is going straight away to the brain for fuel. Meaning if you need your brain to heal, or if you need it to work harder or more efficiently, you can’t feed it junk. It utilizes a lot of nutrients! 2. Your brain utilizes 25% of O2. This is a big point why the craniopathy care is VITAL as well as examining air passageways to make sure it gets enough oxygen to heal/function. 3. The brain is 1-2% of our body fat. 4. The brain is made of 60% fat. “Fat Head”. That means it NEEDS a lot of good fats to function. The more inflammation and damage, the more good fats we need. Hence why so many individuals are leaning towards more ketogenic diets. I’m not saying it’s for everyone, and I modify it for different people, but so many are fat deficient in our society, with too much emphasis on carbohydrates and proteins. 5. The brain is THE MOST affected by nutrition/and it’s environment. We already talked about the brain environment a few weeks ago, so we most certainly need to change that or else nutrition won’t make much difference long term. However, since it’s the most affected by these two, we need to make sure as best as we can we are feeding it what it needs! So what does the brain need? – Well it needs good sources of fats like fish, grass fed meats, coconut oil, grass fed better, oils, nuts, avocados, ect. – It doesn’t need as much protein, but that being said if you are eating good amounts of grass fed proteins and fruits and veggies, protein won’t be a problem. Most people focus too much on getting enough protein which is usually dysfunctional if their upper digestion is improper and not breaking it down. Not so much that you need more consumption. 2. Wild Blueberries – high in natural antioxidants. 3. Greens: Spinach/kale/swiss chard/ collards – high in folate, iron, calcium and vitamins E and K.
These are all wonderful nutrients that help us to utilize that brain power that we need, while giving the vital nutrients needed to heal. Ww also know about the Gut/Brain Connections, as I’m sure you’ve heard me talk in exhaustion by now. The human DNA has over 20,000 genes, which the gut microbiome has 10 million genes. This means that problems in the gut can have a HUGE impact on how our brain and body functions. For instance, you can have gut dysfunction and it not manifest as actual digestion problems. The gut/brain axis is so closely connected that it can really affect anything down that chain. Symptoms such as tired, bloated, brain fog, cravings, or headaches…. All symptoms of dys-regulated gut/brain axis. What I do like to mention though is yes, this gut/brain function is HUGE for adults but who is most affected by gut dysfunction is our children. Children are 10X more likely to feel effects than adults. That means you could give your child a junk meal, high in carbs or sugar, 25% goes straight to the brain for fuel and if given junk the child is going to associate a symptom 10X more and faster. You will see this when a child eats a heavy sugar meal or carb heavy and has a temper tantrum that day or the next couple of days. Or maybe they have a food allergy you don’t know about, because they don’t have a stomach reaction. They are growing and developing, and their brain needs that good nutrition to help those brain pathways to develop. Quick changes in the mood or function of their body is most likely due to inflammation somewhere, and the head and gut are always my first go to’s. It’s also important to differentiate for adults and children the difference between SNACKS and TREATS. On the whole, we shouldn’t consume these foods daily for snacks. Once in a while it can be a “Treat”, like say at a birthday party or an event. But, snacks should always consist of actual food needed to help us function. A study done By Oxford in 2005 showed that brain foods in general helped school children with reading, spelling and writing. When we “feed” the brain what it needs, it will perform how we need it to. The more junk food we consume, the more what is called oxidative stress builds up in our bodies. What do I mean by junk? – Processed foods! Anything in a box or bag. Breads, pastas, rice, GMO foods, fast foods, lots of sugar, corn syrup, hydrogenated oils, to name a few. Basically just not real food. Even some “organic” labeled food can be junk. Like organic crackers… Yes maybe the ingredients are better, but is a high carb load really what you need for your brain, probably not unless you are an elite athlete that burns so many carbs. Oxidative stress can come from other things as well such as physical stress, metabolism, uv rays, alcohol, pollutants and toxins, pesticides and herbicides, lack of sleep, smoking, ozone, emotional stress, processed foods, radiation, car exhaust, EMFs ect…. We DON’T Want oxidative stress because that means our cells and in particular our cell’s membranes won’t work well. We need those membranes to be strong. If they aren’t memory will decline, and chronic inflammation will occur. That’s why eating foods high in anti-oxidants and using other means like Kangan water, DoTerra Essential oils like clove, rosemary, juniper berry and others which are high in antioxidants are so helpful for taking that oxidative stress down. Unfortunately our foods are just not rich enough in these brain nutrients so supplementation is often needed. This is because our quality again is so poor, soil quality ect. So supplementation to fill in these gaps is VITAL. Giving things like Omegas, whole food vitamins/minerals, gingko, alpha lipoic acid, glutathione/milk thistle and others are vital for that brain function. These I offer in my practice. Other’s are needed with brain injury or brain infections that happen. I like to use actual brain gland to support these and stem cell organ supplementation to help rebuild the brain. Other ways we can improve our brain is through neuro aerobics. Doing things to constantly keep the brain active. This is great for ADD, brain fog, memory, brain injury and dementia. -moving while working your brain like working out and counting by 2s and 3s or backwards. Our brain will adapt if we don’t challenge it. That’s why those who are more active have actually smarter brains. There’s so much research for exercise and brain function because it increase difference factors in the brain like NRF2 and others. I hope this topic was helpful to you! Take care of your brain it’s the BEST ASSET you have really. The oil of the week this week is Yarrow Pom. Pomegranate is known as an amazing anti-oxidant, but this nutraceutical combines cold pressed pomegranate oil with Yarrow EO! It’s the first of it’s kind. 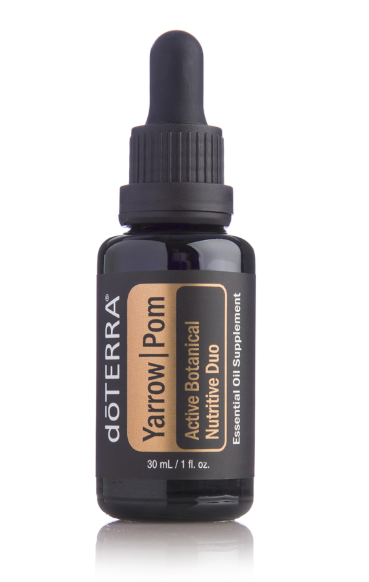 A unique blend of Yarrow essential oil and Pomegranate seed oil, the doTERRA Yarrow|Pom Active Botanical Nutritive Duo offers significant benefits for the skin, body, and emotions. This proprietary blend has been carefully crafted to provide benefits related to the aging process, feelings of vitality, and overall wellness. Once you experience the variety of benefits that Yarrow|Pom oil has to offer, and breathe in the distinctive fruity, spicy, and herbaceous aroma, you’ll see that this is a blend you definitely want to add to your essential oil collection. One significant benefit of Yarrow|Pom is the potential the oil holds for calming the body and mind. * Properties within the oil make it useful for those days when you need to calm or uplift your heart and mind. Diffusing or inhaling the oil is an easy way to take advantage of the calming effects of this oil. The next time you would like to promote feelings of calm, put a drop of Yarrow|Pom in the palm of your hand, rub the hands together, place the hands over the nose, and inhale deeply. When you’ve had a moment to breathe in the unique aroma of Yarrow|Pom oil, rub the excess oil over your heart to provide calming feelings throughout the day. Due to the chemical makeup of the oil, Yarrow|Pom is useful for promoting cellular, immune, and nervous system health. * One of the chemical constituents in Yarrow|Pom oil known as Beta-Carophyllene (β-caryophyllene) has substantial benefits for the immune and cellular systems. To promote a healthy immune response, consider taking one to two drops of Yarrow|Pom daily by adding the oil to at least four fluid ounces, and swallowing. As mentioned, the uplifting properties of Yarrow|Pom oil can help to calm the body and mind. * If you enjoy using essential oils for mood management, try diffusing Yarrow|Pom oil during the winter or during dark, dreary days in order to uplift your mood. The calming combination of Yarrow oil and cold-pressed pomegranate seed oil will lift your spirits as the aroma fills your home on a monotonous day stuck indoors. As you can imagine, Yarrow|Pom is a great oil to diffuse during holiday parties and gatherings, because it promotes a soothing environment. Furthermore, if you know someone who is feeling down during the holidays, consider sending a bottle of Yarrow|Pom their way for a pick-me-up. Yarrow|Pom oil contains many internal benefits, including powerful antioxidant support, healthy metabolic function support, and benefits for the cells. * When taken internally, Yarrow|Pom oil can help to provide the body with useful antioxidants, promote a healthy metabolism, and restore youthful vitality. No matter your goals for internal health, Yarrow|Pom oil is definitely an essential oil that you will want to incorporate into your regular routine. When incorporated into your skincare regimen, Yarrow|Pom has the potential to promote a smooth, youthful complexion. Both Yarrow and pomegranate seed can help to moisturize and restore healthy-looking skin, while also working to reduce the appearance of skin imperfections. As a special, proprietary blend, this essential oil works to activate protecting proteins within the skin in order to protect the complexion from enzymes that breakdown collagen and elasticity. To take advantage of the revitalizing and skin-protecting benefits of Yarrow|Pom oil, try applying two drops to the face, chest, neck, and hands each morning and night. The properties of Yarrow|Pom oil make it useful for providing the body with targeted benefits. Because the oil is calming to the body and mind, it can be used as part of a relaxing massage after a long, tiring day. To experience the targeted benefits of Yarrow|Pom oil, use the oil to create a rejuvenating massage that will help to soothe tension in certain areas. The exclusive, proprietary doTERRA Yarrow|Pom blend contains chemical components that support the body when taken internally* With chemical components like the omega 5 punicic acid, antioxidants, β-caryophyllene, and chamazulene, the Yarrow|Pom oil blend supports immune, nervous system, and cellular function and rejuvenation. * Not to mention, the blend is vegan-friendly. Happy Monday Everyone! I hope you’ve all enjoyed this month’s topics so far about brain injury. Last week we went over brain injury and the connection with your bite. If you missed it don’t worry, you can head on over to my website and catch it! This week we will be digging deeper into the part of brain injury that gets kind of shoved under the rug, and that’s the emotional aspect. PTSD for example: An estimated 70 percent of adults in the United States have experienced a traumatic event at least once in their lives and up to 20 percent of these people go on to develop post-traumatic stress disorder, or PTSD. An estimated 5 percent of Americans—more than 13 million people—have PTSD at any given time. PTSD is not just found in our military, although it is extremely common. So, being so common you’d think it would be talked about more, or at least more treatment options. However, it’s quite to opposite. Especially in our veterans and military care, many are not even given proper examinations and are just medicated as the only option. However, in my practice I always want to find a source. And through my research of the brain, I’ve found time and time again research connecting PTSD, mood dys-regulation and the such to previous head trauma. In my practice, since I ask all the questions, for anyone either young or old with any mental health concern or issue, head trauma is ALWAYS my #1 question. Because of this research and lots more just like it. Head trauma causes imbalances within the whole body, including the emotional system. So shouldn’t that be the first question doctors ask when vets come in with PTSD like symptoms? Or what about even just headaches or pain? I would think so.. but unfortunately it’s not, and that is why more education is needed. Chronic in pain in general can also cause mental/emotional issues to arise. Pain and especially chronic pain messes with the head. It interferes with what we can do. Which then causes emotions to arise because of the limitations it produces. Taking chronic pain away naturally in itself can relieve a good amount of emotional issues that have arose. This is because when the brain and nervous system are constantly bombarded with pain signals, stabilizing the emotions isn’t a priority. It just isn’t. Regulating your neurotransmitters and hormones isn’t a priority when it has to constantly focus on pain, heart beating, lungs pumping, ect. When you start alleviating some of that pain, you free up your brain to focus on those emotional issues. But, what if you can’t find the source of pain? This is often the complaint of individuals that find their way to my practice. Well, did they even ask about your head? If they did and you had a concussion or brain injury (don’t have to hit your head), what are your options? Maybe some of the above mentioned can be utilized if the provider is open minded. But I find the actual brain environment is NEVER addressed. Craniopathy care is not very known. But normalizing that movement is HUGE for that chronic pain and dysfunction. I’ve seen time and time again in my practice that emotional traumas start coming up. Why? Well cranial care in general opens up and frees the brain to focus on other aspects that need healing. Emotional traumas are one possibility. This is where the technique I utilize in my practice called NET (neuro-emotional technique) comes into play. Utilizing this after doing the cranial care allows the patient’s thought processes to start changing from “always have” to “had in the past, but now can heal” for example. These are REAL treatments for these types of conditions. These aren’t ALL the treatments though. I still recognize and appreciate the other benefits and needs of mental healthcare professionals absolutely. I just think first taking care of the brain and though processes is and should be the first priority. In other ages, say children with emotional issues, head trauma can come even just from the birth process, or any head trauma they had otherwise. Hitting their heads, sports, ect. If you notice a mood change, check the brain and nervous system first and calm it down. For other PTSD related issues, the treatment is still the same in my office. Find the cause. What is the trigger? Can we change those though processes? Can we balance the brain more to handle it? What else is causing inflammation in the brain? We will talk about nutritional recommendations for brain injury and healing next week, so stay tuned warriors. The oil of the week this week is Copiaba. Instead of focusing on just one species of Copaifera, dōTERRA recognized the power behind a blend of several species to ensure the highest quality and potency. Resin from Copaifera reticulate, officinalis, coriacea, and langsdorffii are meticulously harvested and combined to create a synergistic blend. Not only does this increase the therapeutic power of the oil, but it also enables the different species to offer their best components to the blend for one power-packed essential oil with high levels of the primary constituent beta-caryophyllene. If you will allow me to tap into my science nerd for a moment, I can break down the basics for you. The main chemical component of Copaiba is the cannabinoid beta-caryophyllene, or BCP, though it does NOT affect the body like the psychoactive cannabinoids in marijuana. We all have endocannabinoids in our bodies that communicate with receptors. They balance a wide variety of tasks to keep our body balanced both internally and externally. From immune and inflammatory response to memory recall and appetite, these endocannabinoid receptors are busy supporting the body to keep us in top condition. In recent years, scientists have studied these cannabinoids for a way to harness their neuroprotective nature and sustaining benefits. They have identified two subtypes – CB1 and CB2. Theres a lot more to discover! CB1 occurs in the nerve cells of the brain to influence memory and pain regulation, but, when triggered, does produce the psychoactive effects we commonly associate with a “marijuana high.” This has led scientists to search for a solution that does not create the “high,” most often in a synthetic version. And lurking in the Amazonian rainforests was Copaiba rich with beta-caryophyllene. CB2 receptors work within the immune system where they affect white blood cells to support healthy immune function while soothing and relaxing the body to reduce inflammation. BUT…and it’s a huge one…when triggered, they do NOT have the same psychoactive effects on the body. The primary constituent of Copaiba – beta-caryophyllene – can bind to the CB2 receptors, thereby supporting a healthy nervous system as well as supporting immune function. While it offers similar support as its essential oil counterparts – Black Pepper, Clove, Melissa, and Rosemary – its ability to bind to the CB2 receptors allows the body to find relaxation and soothing without the psychoactive side effects. And dōTERRA Copaiba EO boast over 60% of beta-caryophellene! Based on this research concerning the CB2 receptors, scientists have found Copaiba to be an amazing alternative to synthetic versions of pain relievers, especially for those suffering from chronic conditions. Some even say that it may top Helichrysum in its ability to naturally relieve the body and reduce inflammation of many different kinds. Combining it with Clove and a carrier oil creates an amazingly powerful topical spot treatment or massage blend for those suffering from chronic pain. Also great for teething in infants! Eat berries every day. Berries are full of antioxidants which help protect your brain. They are also high in fiber, lower on the glycemic index (so they don’t cause inflammation), and a wonderful healthy snack. Try this easy berry smoothie to work more berries into your diet! Place the cashew milk and spinach in a high-speed blender and puree until smooth. Blend in the protein powder. Add the remaining ingredients and blend until a thick and creamy consistency is reached. Pour in additional nut milk, if necessary. 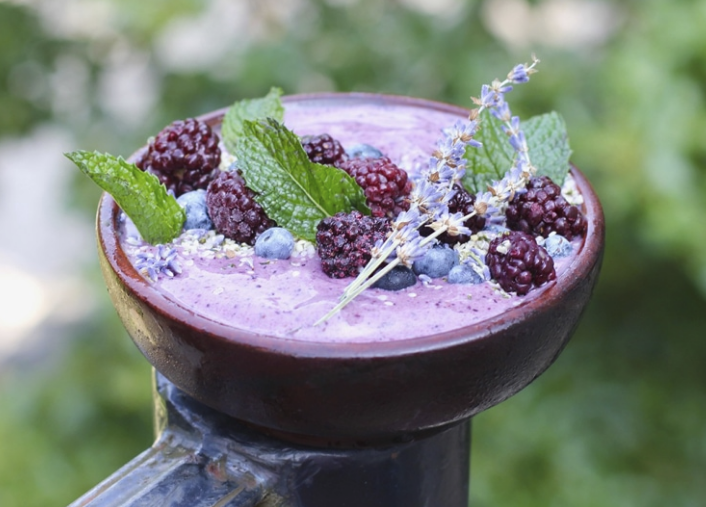 Top with berries, fresh mint, hemp seeds, and additional lavender.